Even Spain's king had to cover his eyes with victory so close. Then Juan Carlos Ferrero provided the winning point, and the king joined the singing, flag-waving crowd in celebrating Spain's first Davis Cup title, its 79-year wait over. Ferrero beat Lleyton Hewitt 6-2, 7-6 (5), 4-6, 6-4 in almost four hours Sunday for an insurmountable 3-1 lead over defending champion Australia in the best-of-five series. "It's one of my best victories, well, the best," Ferrero said. "I'm on cloud nine." The best tennis country never to have won this showcase event finally had the 101-year-old silver bowl. In a match between two of the game's best young players, Ferrero broke Hewitt to love in the first game and thwarted the tenacious Aussie each time he threatened to wrest control. The 20-year-old Spaniard got in more first serves, made fewer unforced errors on the slow clay and lashed baseline shots from both sides. 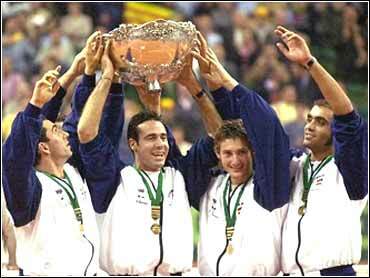 Spain had appeared in two previous Davis Cup finals, both losses to Australia in the 1960s on grass. But with a victory over the 27-time champions the sellout crowd of 14,000 finally had a title all its own. After the winning shot, Ferrero's teammates raced on court and piled on, creating a minor dust bowl. Spain's top player all season, Alex Corretja, hoisted him on his shoulders and circled the court heading for the royal box. With the crowd at Palau Sant Jordi chanting "campeones" (champions) and singing "Que Viva Espana," King Juan Carlos and Queen Sofia reached over a railing and shook Ferrero's hand. "I wasn't too nervous, I had met them before," he said. "It was nice to have them alongside and cheering us on." An avid tennis fan, the king embraced the Spanish players and captain Javier Duarte as he handed over miniatures of the cup. Then he patted Hewitt on the cheek to console him, pausing for a minute to joke with Australia coach John Newcombe. "I said to the king that I was watching him towards the end of the match -on some of those points - and he had his hands covering his eyes," Newcombe said. "He was very nervous, so we just laughed about it." Newcombe, who is retiring from the Davis Cup with coach Tony Roche, saluted the same fans he had criticized the first two days for cheering Australia's errors. "This time we had to come to your country to defend the cup," Newcombe said. "We tried our best but in the end you were just too good." But Newcombe had some words of caution for the fans. "Next time we play, you better be prepared to play on what the cows eat ... grass," he said. Spanish captain Jvier Duarte paid tribute to those instrumental in building Spanish tennis, including Manuel Santana, who was fired a year ago as captain. Santana did not attend the final, playing instead in a tournament in Florida. "This Spanish generation of players is the best generation of tennis we have ever had," Duarte said. "It's going to be very difficult to get another generation as good as this one." Hewitt, who won his opening singles match Friday, bemoaned his inability to force a fifth set. "Two days ago I was saying I had the greatest feeling out on that court and now it's probably the worst feeling of my tennis career so far. ... I couldn't have asked any more of myself," he said. On Friday, the 19-year-old Aussie defeated Albert Costa in five sets, and Ferrero downed Patrick Rafter, with the Aussie retiring in the fourth set because of cramps. In Saturday's doubles, Corretja and Joan Balcells swept Sandon Stolle and Mark Woodforde to give Spain a 2-1 lead. Sunday's remaining singles match between Corretja and Rafter was called off, leaving the final score 3-1. "Today was something special because we saw two of the future people of the world of tennis playing in that sort of a match," Newcombe said. Ferrero, who plays an all-court game unlike most Spaniards, couldn't stop smiling. "I don't know if this will change my life, but certainly the experience of having won a Davis Cup at 20 gives me confidence for other tournaments," he said. "It's a dream come true, it's tremendous joy for us." Ferrero got the winner with a backhand passing shot down the line. The shot came on the fourth match point of the game after Ferrero had been up 15-40 and couldn't convert. He finally did on the second ad point. "I was very nervous because we were so close and I was just trying to play as normal as possible," he said.